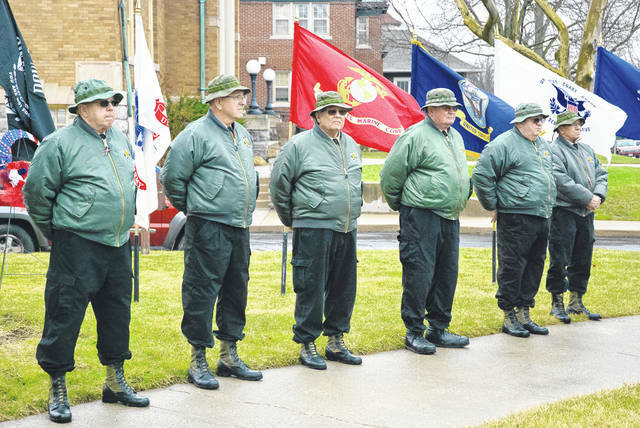 In honor of National Vietnam War Veteran’s Day, the Vietnam Veterans of America Chapter 1095 conducted a ceremony Friday afternoon in front of the Historic Delaware County Courthouse, 91 N. Sandusky St., Delaware to commemorate the day. President Donald J. Trump, signed into law The Vietnam War Veterans Recognition Act of 2017, March 28, 2017, designating every March 29 in perpetuity as National Vietnam War Veterans Day. The bill included March 29 in with all the other days on which the flag should especially be displayed — Armed Forces Day, Memorial Day, Independence Day, National Korean War Veterans Armistice Day, Navy Day, and Veterans Day. Standing on the steps of the historic courthouse, VVA Chapter 1095 President Harold B. Wolford said March 29 was chosen as the date to honor Vietnam veterans because it was the day in 1973 the last U.S. combat troops were removed. According to the U.S. Department of Veterans Affairs, there are an estimated 6.4 million living Vietnam Veterans and nine million families of those that served in the war. The Vietnam War Commemoration honors all United States veterans who served on active duty in the U.S. Armed Forces from November 1, 1955, to May 15, 1975, regardless of their location in the war. Wolford said there were 47,378 hostile casualties and 10,800 non-hostile casualties. “I don’t know what they mean by that,” he said. Wolford continued down the list and said that 8 nurses died, one was killed in action, 17,539 married men lost their lives due to the war and that 61 percent of the men killed were 21 and younger. He said 25 percent of the total forces in country were draftees and that 66 percent of the U.S. forces members were drafted during World War II. Wolford said by Presidential Proclamation, the U.S. Vietnam War Commemoration will continue through Veteran’s Day 2025. “National Vietnam War Veteran’s Day is ours forever,” he said. This entry was tagged D. Anthony Botkin, delaware county, Harold Wolford, National Vietnam War Veteran’s Day, Veteran, Vietnam, Vietnam Veterans of America Chapter 1095, War. Bookmark the permalink.